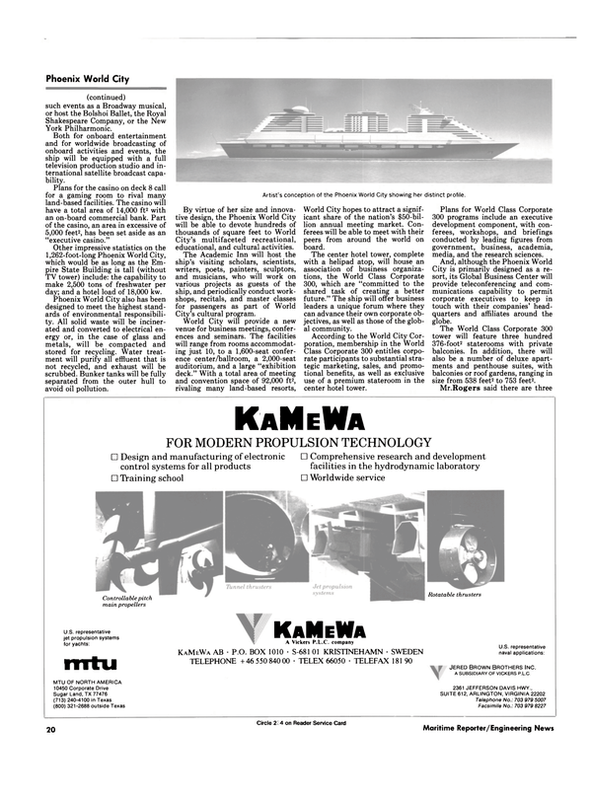 Commercial shipbuilding in the United States recently received a vote of confidence in both its ability to construct commercial ships and competitiveness when New Orleansbased Avondale Industries outbid its European counterparts for the contract to complete final engineering and prepare a firm bid price and delivery date for construction of what would be the world's largest cruise ship. The initial contract was signed between Avondale and the shipowner, the World City Corporation, owned by the World City Foundation. The preparation of the contract bid package is expected to be completed by October. An additional four months will be required for preparation of a firm-fixed price and delivery, and the quotation will be good for 120 days, at which time World City would secure financing. One of the boldest and most ambitious projects ever conceived in cruise ship history, the construction of the colossal 5,600-passenger Phoenix World City—she would be longer than a U.S. Navy Nimitz Class aircraft carrier—in the U.S.
would mean an influx of hundreds of millions of dollars to the builder or builders and equipment suppliers involved in the work. Industry analysts have estimated the value of the cost of construction at anywhere from $800 million to as much as $1.2 billion. The billion-dollar brainchild of Knut Utstein Kloster, chairman of the World City Corporation, pioneer in the Caribbean cruise market, the Phoenix World City would have a gross tonnage of 250,000—more than three of the world's most prestigious cruise ships, the Norway, QE2 and Sovereign of the Seas, combined. Lightweight tonnage of the megaliner would be 95,500 tons, with an overall length of 1,262.8 feet, maximum beam (at decks 8-11) of 252-1/2 feet, and a maximum draft of about 33 feet. According to Stan Wallace, engineer, advance programs and marketing, Avondale Industries, the Phoenix World City will feature twin-screw diesel-electric propulsion, consisting of two 20-MW main propulsion motors per shaft, with eight diesel generators of 9,600 kw each. The ship's stainless steel variable- pitch propellers would be 7 meters (about 23 feet) in diameter. "We have worked with a number of companies," said Mr. Wallace, "but at this stage we have not decided on which diesel-electric propulsion system we will use." Four 2,500-kw bowthrusters and four 2,500-kw stern thrusters with separate motors will provide the Phoenix World City with added maneuverability. The Phoenix World City's passenger capacity of 5,600, with 600 additional berths for third and fourth passengers, would be more than twice that of Carnival Cruise Line's Fantasy or Royal Caribbean's Sovereign of the Seas. In fact, the Phoenix World City's complement of officers, crew and staff of 1,800 is almost as large as some of today's superliners' passenger capacities. As explained by Mr. Kloster, the proposed Phoenix World City is: "The largest and most exciting passenger vessel on earth, a premier resort, a fabulous destination in and of itself, a world-class conference and business center. World City [is] an international city at sea, a cultural spaceship for education, exploration and enrichment, a global forum for the advancement of international cooperation, understanding and exchange." Commenting on the recent contract signing between Avondale and the World City Corporation, Albert L. Bossier Jr., chairman and chief executive of Avondale, said: "Avondale is pleased to be included as part of the team working to bring this historic project to completion. Our company believes that its modular construction techniques and productive labor force will enable it to submit a firm offer demonstrating our capability of producing a vessel of this scale and complexity on terms which will be competitive in the world market." John S. Rogers, vice chairman and chief executive officer of the World City Corporation, said, "World City Corporation is confident that U.S. yards can be competitive and, in fact, come in well below bids of European yards." He cited the low dollar, technological advances, competitive wage rates, ever increasing productivity, experienced and skilled personnel as the main reasons for his company's confidence. Mr. Kloster stated that: "the agreement with Avondale represents an important step in the development of the Phoenix World City. It provides for performance of the extensive shipyard work on which any firm offer for construction of a project of this magnitude must be based, and even more importantly, it now assures that World City will receive a timely offer and fixed delivery schedule, prerequisites for completion of financing arrangements." Mr. Kloster also went on to state that the agreement raises the "very real possibility of both building Phoenix World City in the United States and operating her under the American flag." The Phoenix World City has been designed by Tage Wandborg of the Knud E. Hansen firm of Copenhagen, Denmark, a noted ship architect and designer of more than 30 modern cruise ships. Massive portals in the stern of the vessel open to reveal a large marina within the ship. This is the port of arrival for World City's visitors when the ship is at anchor or underway. The marina itself is a spacious and charming "harbor," complete with music, palm trees, cafe, shops, and even a tropical waterfall. The 21-deck Phoenix World City has been designed to give passengers freedom and spaciousness without losing her sense of community: village squares, parks, a "downtown" area, Rendezvous Plaza, Main Street, galleries, museums, a interdenominational house of worship, tropical gardens, a sports arena, sidewalk cafes, nightclubs, cinemas, bistros, discos, six pools, six jacuzzis, university center, a 100,000-volume library, business center, brokerage office, arts complex, medical center, fire station, police station, and dozens of the world's most famous-name shops, boutiques and restaurants. The ship's 12 restaurants will occupy a total area of 4,800 m2 (51,840 ft2). The ship's 2,000-seat theater, with mezzanine, located on decks 7 and 8 will be large enough to stage such events as a Broadway musical, or host the Bolshoi Ballet, the Royal Shakespeare Company, or the New York Philharmonic. Plans for the casino on deck 8 call for a gaming room to rival many land-based facilities. The casino will have a total area of 14,000 ft2 with an on-board commercial bank. Part of the casino, an area in excessive of 5,000 feet2, has been set aside as an "executive casino." Other impressive statistics on the 1,262-foot-long Phoenix World City, which would be as long as the Empire State Building is tall (without TV tower) include: the capability to make 2,500 tons of freshwater per day; and a hotel load of 18,000 kw. By virtue of her size and innovative design, the Phoenix World City will be able to devote hundreds of thousands of square feet to World City's multifaceted recreational, educational, and cultural activities. The Academic Inn will host the ship's visiting scholars, scientists, writers, poets, painters, sculptors, and musicians, who will work on various projects as guests of the ship, and periodically conduct workshops, recitals, and master classes for passengers as part of World City's cultural program. World City will provide a new venue for business meetings, conferences and seminars. The facilities will range from rooms accommodating just 10, to a 1,600-seat conference centerAiallroom, a 2,000-seat auditorium, and a large "exhibition deck." With a total area of meeting and convention space of 92,000 ft2, rivaling many land-based resorts, World City hopes to attract a significant share of the nation's $50-billion annual meeting market. Conferees will be able to meet with their peers from around the world on board. The center hotel tower, complete with a helipad atop, will house an association of business organizations, the World Class Corporate 300, which are "committed to the shared task of creating a better future." The ship will offer business leaders a unique forum where they can advance their own corporate objectives, as well as those of the global community. And, although the Phoenix World City is primarily designed as a resort, its Global Business Center will provide teleconferencing and communications capability to permit corporate executives to keep in touch with their companies' headquarters and affiliates around the globe. In comparison, the Navy's newest hospital ships, the San Clemente Class USNS Comfort and USNS Mercy, are designed as 1,000-bed facilities. Ron McAlear, Avondale's Phoenix World City project team leader, said: "Detail design and engineering would begin immediately upon contract signing. If everything goes as planned, a contract can be entered into by July 1991. Physical construction would start in early to mid-1992." Mr. McAlear added: "Avondale is very capable of building the vessel and is extremely interested in the Phoenix World City project. This program is valuable to Avondale in the sense that its assists Avondale's corporate commitment to obtaining a larger percentage of commercial work. The Phoenix World City will provide work in a time when current programs are coming to a comple- tion in the shipyard." Avondale Industries has been involved in a number of naval, commercial and industrial projects over the years. Among its commercial shipbuilding projects are: the construction of all 22 LASH vessels built in the U.S.; six 164,000-dwt crude carriers for SOHIO and Exxon; two container vessels for APL; three multiproduct carriers for Exxon; and two chemical carriers for Ogden. At present, Avondale is in the midst of constructing 16 auxiliary fleet oilers and six Landing Ship Dock (LSD) ships for the U.S.